United Kitchens of India has become one of our favorite new restaurants in the city. Don’t let the bright sign fool you, coz once inside, opens up a world of food and drinks. As you cross over the bridge to be ushered in, the interiors are quite swanky and bright. The outside cabana-styled our seating is our favorite spot. But here in this post we aren’t getting into discussion about their amazing food and ambience. It’s going to be about their Liquids. Yes, those shiny cocktails which has us going ‘Ooooo’ (minion like….) every time we order one. We list out below our 5 favorite cocktails off the United Kitchen of India menu…. Lotta: When it comes to Master Mixologist Sharad Arora, his legacy of the Lotta precedes him. A mean cocktail would be an understatement to describe the Lotta which has won several awards. I do love the infusion of tenderness of the coconut in the white rum. Mint Julep, Basil and Passion Fruit come together in a lotta to give it the much needed freshness. We have tried variations in dark rum too and must say, they add to the flavor. Gulaboo: For people who like Whiskey and yet don’t like to drink it neat, the Gulaboo is for you. Rose Water, fizz and fresh rose petals give the whiskey a slight hint of sweetness which isn’t overpowering at the same time. Espresso Martini: This classic-stylish and killer drink is a real potent drink. It has quite the kick of sweetness and rich. The Espresso Martini at United Kitchens of India adds a tinge of hazelnut to give it their own sweet twist. Gin Fizz: The Gin Fizz is my personal favorite here. On a sunny day this should be the drink in your hand. It’s extremely refreshing and is like drops of sweet nectar going down the throat. UKI makes the Lemon Sorbet fresh with every order, so I know for a fact that I’m going to get neatly packed one in my glass. The gin is infused with lemongrass in the Gin Fizz. Road No. 45: The Road No. 45 is United Kitchens of India’s signature drink. Named after the road they are located on i.e Road No 45, Jubilee Hills, the cocktail brings in a balance of sweet and sour with elderflower syrup, mixing together the richness of bubbly and gin. 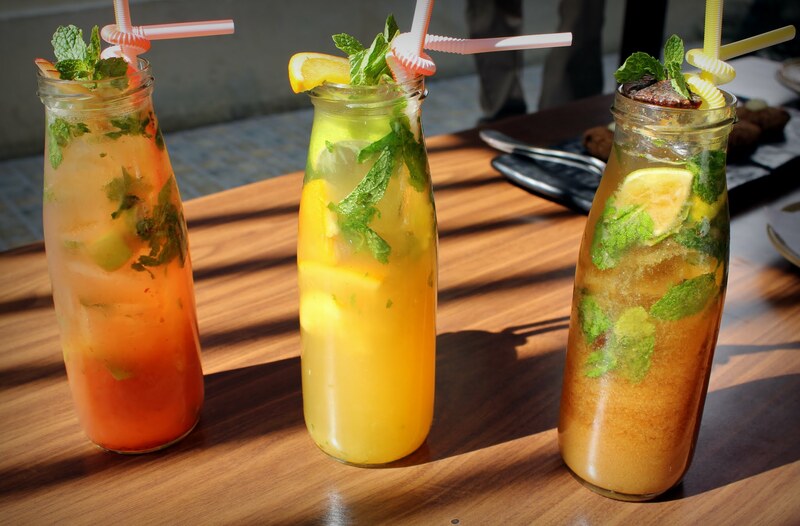 Other notable mentions include the Sufiana, Narangi Chaska and the Twisted Mojitos which come in choice of flavors like Plum & Passion Fruit/ Mandarin/ Raw Mango/ Kiwi & Fennel/ Fig & Tamarind. They also have some amazing range of Beer Cocktails if you’ve exhausted through their vast cocktail menu. In the video below Mixologist Sharad Arora shows us how to whip up a mean Sufiana, their take on the Absinthe.